Preheat oven to 350°. Grease a 9"x 13" baking pan. Using an electric mixer on medium speed, beat butter and sugar until light and fluffy. Add eggs, one at a time, mixing well after each addition. Mix in lemon juice and lemon zest. Gradually add flour mixture, mixing just until combined. Stir in sour cream. Transfer batter to prepared pan. Bake for 25-30 minutes, or until a pick inserted into the center comes out clean. Whisk together condensed milk and 1/4 cup lemon juice until smooth. Using the round handle of a wooden spoon, poke holes about 1/2 inch apart over entire surface of warm cake, making sure not to poke all the way to the bottom of the cake. Pour mixture over cake. Note that not all of the mixture will be absorbed into the cake. Allow cake to cool completely. Refrigerate cake for at least 1-2 hours to allow topping to set and soak into cake. 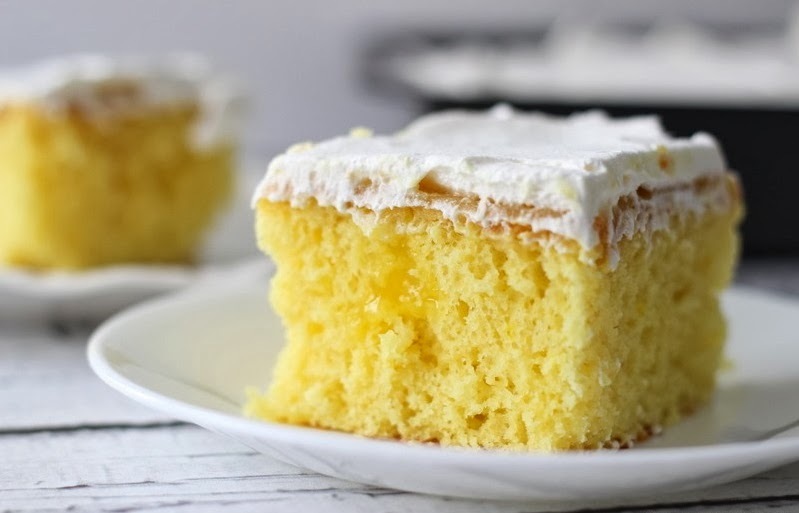 Beat cream cheese, confectioners' sugar, and 1 tablespoon lemon juice until smooth. Spread evenly over topping of cool cake. Refrigerate at least an hour before serving.